Edwin Lyle “Bud” Knox “passed from a temporal to spiritual life” on March 29, 2019. These same words were inscribed on the tombstone of James Knox, Lyle’s 5th great grandfather, who lived in County Tyrone, Ireland when James Knox, born 1723, passed away in 1790. We are using these words in Lyle’s obituary as an honor to both he and his 5th great grandfather. 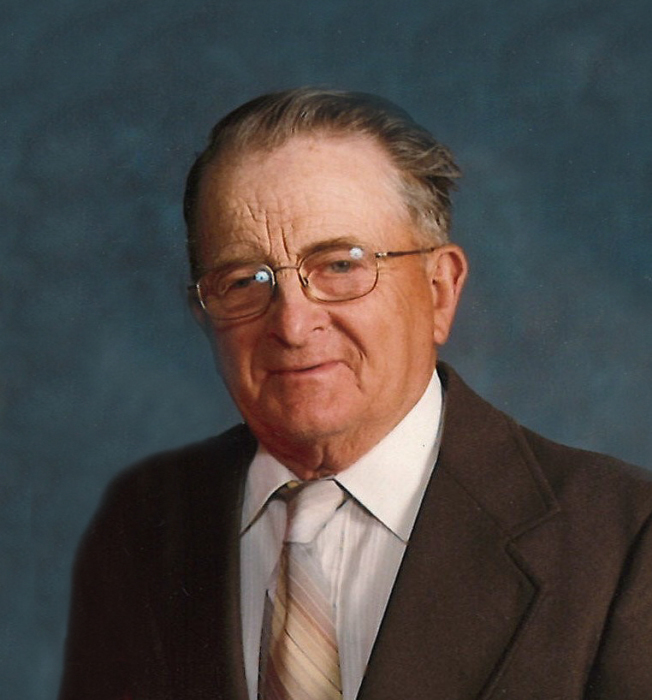 Edwin Lyle Knox was born 93 years ago, on January 11, 1926, to John Cleveland Knox and Alberta Lavisa Norwista (Owens) in their home three miles west of Clearfield and ½ mile north. Lyle was baptized and affirmed his belief in God when he attained membership in the United Presbyterian Church in Clearfield where his parents and family attended church regularly. Lyle attended Cornbread College, the country school ½ mile south of his home on the corner until he attended the Clearfield Community School, where he later graduated from high school. He grew up as a farm boy helping his father raise crops, cattle, and hogs. In 1948, he and friend went skating at the Clarinda Skating Rink. There, he met the love of his life, Gladys Jackson, of rural Villisca. Marrying on February 26, 1949, in the Methodist Church at Villisca, they made their home in his grandfather, Ed Owens’ home, 4 miles west of Clearfield and 2 ½ miles south. Here he and Gladys raised their two children: Connie Kaye Knox (Beck), and Stanley John Knox. Lyle’s family attended the Clearfield United Presbyterian Church until it closed, and then they attended the United Methodist Church in Clearfield. The family farmed and Bud worked with his father on his farm, raising crops of hay, beans, corn and livestock. Lyle had a skill for fixing farm equipment, and he constructed his own round baler carrier when round balers were first invented. Lyle’s life centered around God, his wife and children, and farming. He loved his family dearly and they loved him back. He taught his family to live according to religious virtues. For entertainment, the family went fishing and took trips, often camping in a tent in national and state parks. Lyle was preceded in death by his parents, John C. and Alberta Knox, and two sisters and brothers in law: Hazel Knox Lundberg and husband, Frank, and Maxine Stevenson and husband, Raymond. On his wife’s side, he was preceded in death by brother-in-law, Byron Jackson and Ralph Jackson, and wife, Marilyn and Gladys’ parents, John and Edith Jackson of rural Villisca. Surviving him are his wife of 70 years, Gladys, his children, Connie Beck (Don) of Lenox and Stanley Knox (Dorothy) of Clearfield. Also surviving him are his grandchildren and their families: Natasha Lynne (Beck) Jodoin (husband Jason) of Altoona and their children Gage Alexander and McKenna Marie; Michael John Knox (Bethany) of Redding and their children Tucker John, Mackenzie Nadine, Emily Anne, and Callie Lynn; Travis James Knox (Allison) and their children Courtney Eva, Carson James, and Cora Rene of Winterset; Christopher Joel Knox (Carrie) and their son Kohen Christopher of Clearfield. Also surviving him are his nieces, nephews, and a host of family and friends. He had a special bond with his niece, Mary Collins of Kelso, Washington and Gladys’ cousin, Shirley Ainsworth of Tempe, Arizona and they kept in touch often. Memorials are to be established in his name.